Our Communication Rights In the United States, similar to the majority of Latin American countries, big private corporations own information & communication technologies: telephone, television, radio, Internet, newspapers and magazines, etc. To obtain a commercial license, it is necessary to purchase a pre-existing full power station. This requires enormous upfront capital, which non-profit community groups do not have access too. The high cost of licenses and equipment, coupled with the for-profit climate of media prohibit ordinary people and community groups, especially poor people, women and people of color, from owning and controlling the media. On the rare occasions that individuals within the corporate media tell a different story, they are often silenced by those who own and control the airwaves. For example, during the 2006 massive immigrant mobilizations, many commercial DJs who mobilized members of immigrant communities to participate in street marches were threatened and fired from radio stations. Objectives of the Tour • Promote the use of radio as a tool for participatory communication that facilitates community organizing. With this tour, we would like to visit community stations that already exist and also meet with groups that want to use radio as a tool to organize for social justice. On this tour we will facilitate bilingual workshops on: • Analysis of corporate media: In this workshop participants will analyze the media and discuss the impacts that media has on our daily lives. Through participatory exercises people will have an opportunity to experiment with creative forms of communication. • Participatory Radio as a tool for community organizing: Making radio is more than transmitters and djays and strikes right in the heart of community organizing. This workshop helps groups to spell out the pieces-often invisible-that are need to construct participatory radio. • Strategies for participatory communication: In this workshop participants will identify different models of communication and through collective processes identify the use and impact of each model for the organization. We will also do some public presentations on the role of the media within resistance movements in Latin America and the United States and the fight to make the radio airwaves and the media in general more more fairly distributed in the United States. www.prometheusradio.org – palabraradio.org – www.projectsouth.org Prometheus Radio Project and the Campaign to Expand Low Power FM radio Over the past decade, the Prometheus Radio Project has collaborated with numerous community organizations to start LPFM stations through “radio barnraisings”, which bring together hundreds of volunteers to build a station over a weekend. 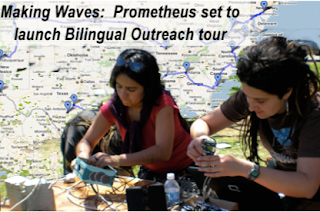 Two LPFM stations launched by these “barnraisings” have inspired Prometheus to partner with Palabra Radio to build a network of immigrant community radio stations through a national tour. Radio Movimiento, run by Northwest Tree-planters in Woodburn, Oregon, and Radio Conciencia, run by the Coalition of Immokalee Workers in Southwest Florida, are excellent examples of how communities can use their media to communicate, solve problems, preserve their language and cultural heritage and organize for economic human rights. Both stations broadcast a blend of cultural and informational programming focusing on worker and immigrant rights, and music from the worker’s hometowns in Latin America and the Caribbean. Low Power Radio Licences Throughout this tour, the Prometheus Radio project will be mobilizing people to support the Local Community Radio Act and to prepare to file applications for the next opportunity to apply for Low Power FM radio licenses from the Federal Communications Commission (FCC). For the last 10 years, Prometheus has been leading the battle for people's access to the radio airwaves. The struggles is based in the principal belief that communication is a basic right. Now we are closer than we have ever been to a very important victory in the legislative campaign to pass The Local Community Radio Act (S592): which is a law that would give an opportunity to various community groups to obtain licenses for new Low Power FM radio stations. We believe that LPFMs can be vital tools and we want to assure that these licenses arrive to the hands of community organizations that will use them to build popular power and strengthen their communities. Low Power radio stations transmit with up to 100 watts and have a range of approximately 3-5 miles. The license are free and are only allotted to non-profit groups. Palabra Radio Network Is a network of technical support and accompaniment of community radio projects in the southeast Mexico, Chile, and within immigrant communities in the united states. Our principle objective is to facilitate and accompany the process of appropriate technologies and the knowledge of organized groups that have a clear message to transmit using this means to organize their community and build social justice. The workshops promote the use of open-source software, and facilitate the documentation and systematization of the process of learning with the objective of creating and distributing materials. As a part of the objectives of this tour, Palabra radio will be distributing and coordinating the realization of new spaces for spanish-language workshops at the upcoming Allied Media Conference from June 18- 20 in Detroit. This year's track will be composed of 4 workshops focussed on strengthening the work of community radio projects already underway in immigrant communities across the country- and the creation and articulation of a network of these radio projects.